The Legislature will consider and vote on many proposals during this 105-day session. Of those the most significant will be a new state operating budget, to take effect July 1. Adopting a new operating budget typically is the most important responsibility we have because it funds most of state government’s core services, including K-12 education, higher education, public safety and corrections, health and human services, and other operations of state government. Considering the growth in our state economy and the increased investments in K-12 education and other services, the next two-year operating budget could be nearly $50 billion. Sometime in late March, after the state Economic and Revenue Forecast Council releases its first revenue forecast of this year, the House budget writers will unveil their proposed new operating budget. Soon after that, the Senate will release its budget proposal. Senate Ways and Means Committee staff will assist the Ways and Means Committee chair, Sen. Christine Rolfes, in developing the budget. Those proposed budgets, in the coming weeks, will be advanced through their committees and debated in their respective chambers – the House and Senate. After each chamber has approved its own budget plan, the House and Senate will work to resolve differences and agree on a compromise budget. Once that agreement is reached, the House and Senate will vote on the compromise budget and the corresponding bills associated with it. After it is passed by the Legislature, it goes to Gov. Jay Inslee for final consideration. I have always advocated for balanced budgets that demonstrate a prudent use of your tax dollars. I am proud of the additional investments the state has made in recent years to K-12 education and other services, due in large part to the growth in our state economy. Given the additional revenues expected through our current taxes, I see no need for new, additional taxes to fund state operations. In the weeks ahead, we will begin to see whether the majority party agrees with this philosophy and is willing to work together to avoid excessive spending and advance a responsible, bipartisan budget. I certainly hope so. Click here for my interview last Thursday with KPQ Radio in Wenatchee. I encourage you to share this newsletter with friends and family. They may subscribe by clicking here. 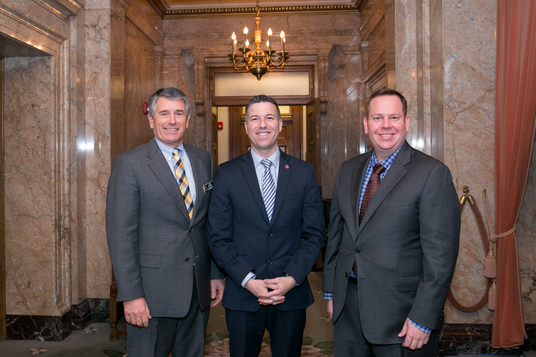 I enjoyed getting together with my 12th District seatmates, Reps. Keith Goehner (left) and Mike Steele (right), for Gov. Inslee's State of the State address this session. Listening and being accessible to you are my top priorities, and I welcome your feedback on issues or concerns. Please contact my office anytime by phone, letter, or email. If you are planning a trip to Olympia, please let my office know so that I can try to connect with you when you’re here. If you or your group would rather save the trip and meet back home, I will be making myself available during scheduled times on Saturdays. Let’s catch up at your office building or over coffee at Pybus Market. Please contact my office at 360-786-7622 or by email at brad.hawkins@leg.wa.gov to set a Saturday appointment. 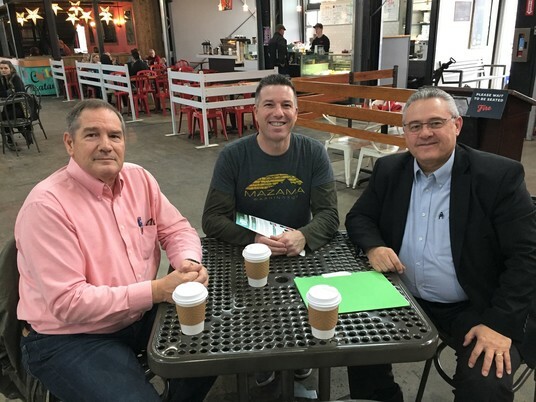 I had a great discussion on election issues and costs last Saturday at Pybus Market with Chelan County Auditor Skip Moore (left) and Douglas County Auditor Thad Duvall (right). Their expertise and feedback are helpful to me as a member of the Senate's State Government, Tribal Relations and Elections Committee. Thank you for the opportunity to serve our 12th District!